Note: As an admin user, you can control the access to add, remove and assign designated members to designated teams. All techpacks and activities will be under your management. Adding members means that you admit them as a part of your brand and allow them to enjoy the features of your plan. Each paid plan has its own quota of members, you can check here for more details. Click on your company name at the top-right corner and a drop-down list will be extended, where the Manage Members button is the first option (see image below). 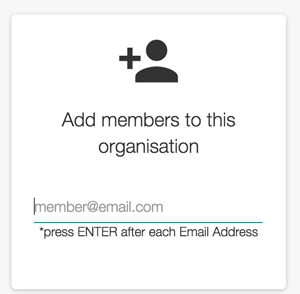 Invite members by adding their email in the space provided (see image below). If the member is already a user, his/her account name will show immediately after adding. For non-user, we will send an email to notify them. Remember to click "Save Organization". To start creating teams make sure you are on your Group Dashboard. Clicking on the Techpacker logo at the top left corner will navigate you to this page (see below). Once there, click on the "New Team" button on the left side of the sub-menu (see image below) and input your new team/group name. You can add members to a team through "Manage Team" on the top right corner of each team. Noticed that only existing organization members can be added to a team (see image below). If you want to invite users out of the list, go back to step 1. Organization owner can see all teams and techpacks here; Members can only see their own teams. Individually assign a techpack to a team directly through Techpack Settings. Use "Assign to Team" option on the settings page to select a team (see image below). When creating a new techpack, you will have the option to assign to a team from those settings. Note: All members of a team will have access to view, edit, and easily send comments to each other inside any techpack within that team. From the group dashboard, click on your personal group (which is the first group highlighted in teal). Once inside your personal group, click to select the techpack/s you would like to move. Lastly, from the drop down menu in the Actions toolbar, click on the Actions button and select "Assign Techpacks to Teams". (see image below).